„As organizations evolve towards DevOps to accelerate digital innovation and software quality, cloud and microservices infrastructure help them shorten development cycles, release faster. But, these technologies and the constant pressure to cut testing time pose real speed and reliability challenges. Application leaders must reduce technical debt and mitigate application performance risks. They should adopt a combined „shift left“ and „shift right“ performance engineering approach to build a highly productive software development organization. IT organizations struggle to meet businesses‘ application performance expectations, particularly for application speed, scalability and quality. 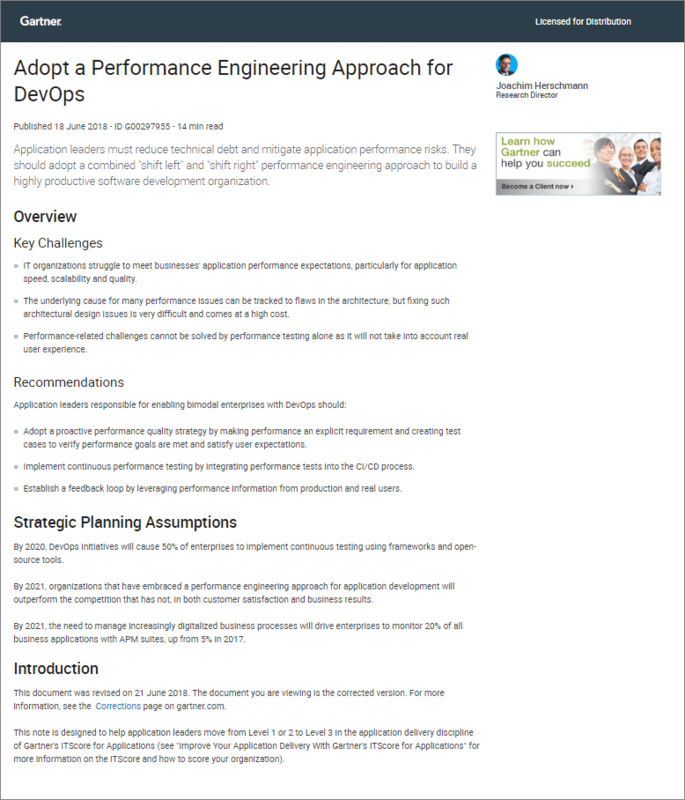 A successful performance engineering approach for DevOps relies on three simple pillars: people, process, and technology. A performance testing platform for DevOps should enable the most reliable assessment of an application’s performance and support an organization’s operations concerning test automation, team collaboration, and integration with the DevOps toolchain. initial component/API delivery (“shift left”) to system-wide end to end pre-prod load and testing in production. A performance testing platform supporting a performance engineering approach has to integrate into the toolchain seamlessly.